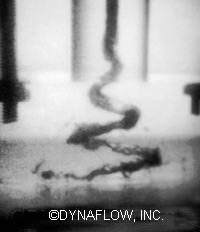 Oxidation Chemistry | DynaJets | Dynaflow, Inc.
Dynaflow, Inc. is continuing development of a novel energy efficient cost effective technology for oxidation of contaminants in water and for removal of micro-organisms. These oxidation and disinfection R&D efforts have been funded in part by the National Aeronautics and Space Administration (NASA), the Environmental Protection Agency (EPA), the National Institute of Environmental Health (NIEHS), and the National Science Foundation (NSF). 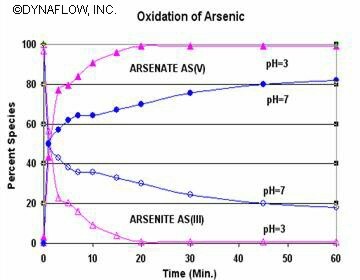 The DynaJets® technology has been found to achieve high efficiency oxidation of a wide variety of compounds and to achieve multiple order reductions in microorganisms. The technology is covered by two patents. Cavitation bubble collapse in a liquid can generate extremely high local pressures and temperatures causing water to dissociate and form free radicals including hydroxyl and hydrogen radicals, which are very strong oxidizing and reducing agents. Hydroxyl radicals can oxidize many inorganic and organic chemicals in water. Organic compounds can be completely oxidized to carbon dioxide and other inorganic species. 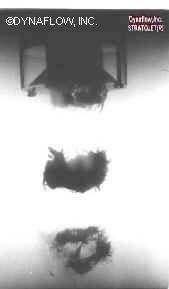 Pyrolysis and supercritical water formation have also been shown to occur. This phenomenon is employed in the field of sonochemistry to accelerate a variety of chemical reactions. It is also tied to sonoluminesence – the emission of light during bubble collapse. 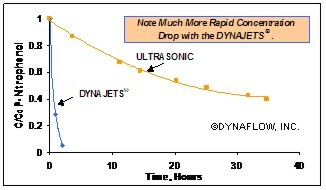 The novel DynaJets® oxidation technology employs hydrodynamic cavitation generated by specially designed submerged cavitating liquid jets to trigger widespread cavitation and bubble growth and collapse leading to oxidation in the bulk liquid. 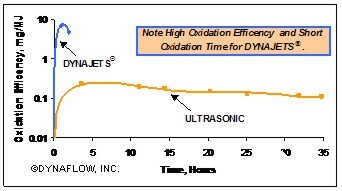 In head to head comparison experiments, DynaJets® have been found to achieve oxidation with energy efficiencies up to two orders of magnitude larger than those obtained with ultrasonic means. This novel technology requires no hazardous chemicals and no special handling. It adapts our proven and patented jet technology (developed to produce highly erosive water jet cutting, drilling, and cleaning) to efficiently generate large quantities of intense cavitation and oxidation while operating at modest pressures. This results in a robust high efficiency system that can be readily scaled to a wide range of capacities. It has been found to achieve energy efficiencies up to two orders of magnitude larger than those obtained with ultrasonic means. 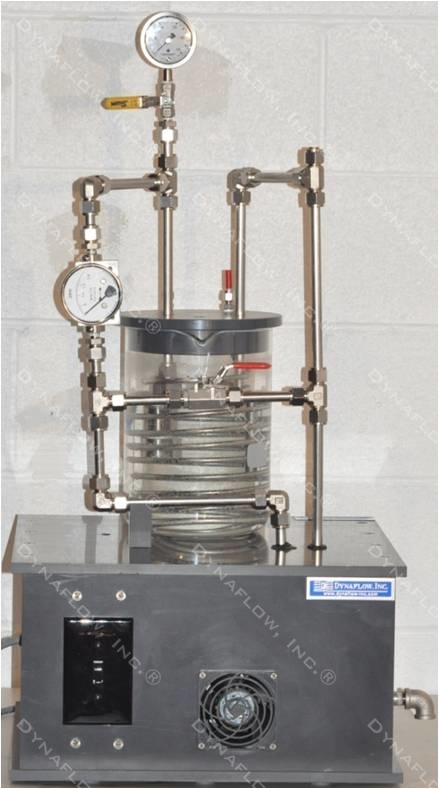 This system is suitable for small scale hydrodynamic cavitation testing. 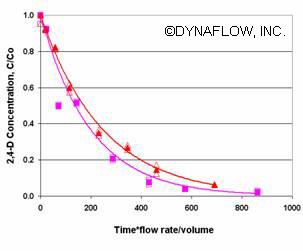 The system consist of a DynaJets® nozzle in a water cooled glass reaction chamber with stainless steel plumbing. It is powered by a Rotary Vane pump and is housed in a chemically resistant PVC cabinet.